According to the Food Waste Reduction Alliance (FWRA), food waste is defined as ‘any solid or liquid food substance, raw or cooked, which is discarded or intended or required to be discarded’. Food waste is regarded as a widespread problem throughout the food industry and occurs in every aspect along the supply chain in the United States as well as worldwide. In 2015, the value of the food waste from U.S. homes, consumer-facing businesses, farms, and manufacturers came to approximately 218 billion U.S. dollars. From U.S. homes alone, some 27 million metric tons of food was wasted in 2015, out of a total of nearly 63 million metric tons. One example of a food that is wasted by nearly one third in the U.S. is bread. As of 2016, some 32 percent of bread is wasted in the U.S., with 20 percent of that amount wasted in the kitchen, and the remaining 12 percent wasted in the store. The environmental implications of food waste are considerable as well. It has been estimated that 281 billion gallons of water could be conserved in the U.S. through consumer education programs targeting a reduction in food waste. For greenhouse gas emissions, it has been estimated that some 2.34 billion tons of food waste-related greenhouse gas emissions could be mitigated through consumer education programs. A recent survey revealed that some 77.2 percent of Americans feel guilty when throwing food away. 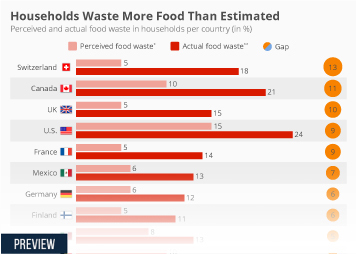 It is also interesting to consider the food waste in the U.S. in contrast with the amount of individuals who struggle with food insecurity there.